Maybe I’ll be boring with this note, but again I need to write that this was another good year for C++! Visual Studio 2015 was released with great support for C++14/17 and even more experimental features. Long-awaited GCC 5.0 was released at the beginning of the year. At CppCon 2015 there were some really important announcements made. C++17 seems to be just around the corner! See my full report below. Just for the reference Clang, GCC and Intel Compiler have full support for C++11. Update: previously I've listed here 'Atomics in signal handlers' - as missing, but I skipped one note written here by StephanTLavavej - " I previously listed "Atomics in signal handlers" as No, because despite maintaining 's implementation, I didn't know anything about signal handlers. James McNellis, our CRT maintainer, looked into this and determined that it has always worked, going back to our original implementation of in 2012. " So, all in all, this feature is working as expected since 2012. Clang and GCC fully implement C++14. Visual Studio 2015: the compiler is getting closer to the full conformance, they’ve implemented Sized deallocation, [[deprecated]] attribute and Single-quotation-mark as a digit separator. Intel has also made a good progress, they’ve added support for generic lambdas, member initializers and aggregates, [[deprecated]] attribute and Single-quotation-mark as a digit separator. Obviously most of us are waiting for something big that should happen in relatively short period of time: C++17 should be standardized! Compilers has still some work to do on the full C++11/14 conformance, but most of the features are there for us. Most of the compiler teams actually moved into experimenting with some of the new features. Moreover, C++17 is a major release, so people expect to get something important, not some little updates. What’s on the list then? Also, the features that won’t be ready will be shipped with C++20 that is planned to be a minor release. 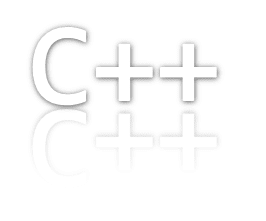 C++20 will complete C++17 as C++14 completes C++11. At CppCon in the keynote presentation, Bjarne made an important announcement: Core guidelines! effectively. By “modern C++” we mean C++11 and C++14 (and soon C++17). time, given that you can start now? In 10 years’ time? Since the language is getting more complicated, modern, and even simplified at the same time it’s very welcomed to have a guide that will help to write good modern C++ code. Some older rules are now superseded by new approaches - for example RAII. It’s not that easy especially when you’re working on a legacy code and you’d like to add some fresh modern code into your project. Guidelines are developed collaboratively, so it seems the rules should be practical. This year, as expected, there were two meetings: Kona in October and Lenexa in April. Next meeting are announced, it will be in Jacksonville, Florida in February. Then, there will be a very important meeting in Oulu, Finland at the end of June - important because Draft for C++17 will be voted there. Compiler 16.0 was released in August. This year two C++ conferences gained my attention: CppCon and MettingCpp. * Lots of experimental features available to play. As we can see C++ Standardization Committee is working hard to bring us C++17 that really includes huge and important features. At the end of the next year we should be seeing the full C++17 draft accepted. What’s even better, we have lots of experimental work already in our compilers. We can play with modules, concepts, ranges, co-routines… This might not be safe for your production code, but definitely it’s great for learning and testing this new stuff. Feedback gained from those early-staged implementation might be very valuable when the final spec is realized. And, I hope, the committee will include that feedback in their work. VisualStudio team become more open, they’ve done huge improvements with the latest release of VS 2015. Not only you can create multiplafrotm apps (thanks to embedding Clang) but also they are quite fast with new, experimental C++ features. 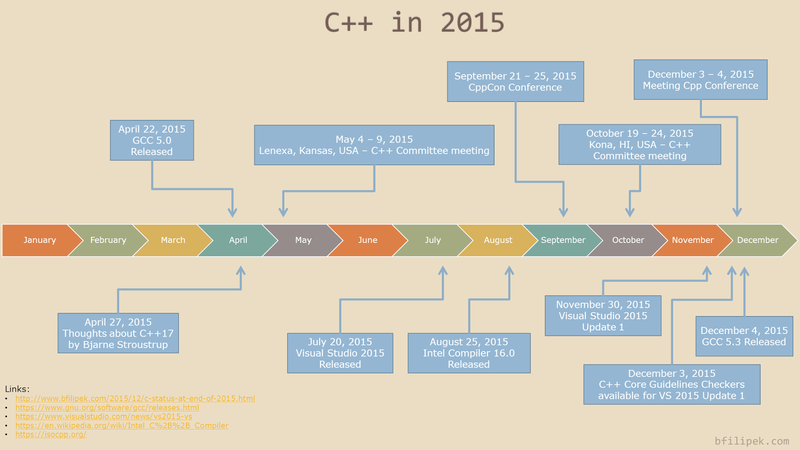 What do you think about C++ in 2015? What features would you like to see in C++17?